Made in the USA, and backed by a lifetime warranty, RAM mounting products are some of the best in the industry! Available in three mounting options (Yoke, Suction Cup, or Glare Shield) these mounting systems allow you to create a custom and secure set up within the cockpit. The RAM Mount System for 10 inch iPads has been specifically molded to accommodate the iPad, iPad 2, iPad 3 and iPad 4, iPad Air and HP Touchpad via the spring loaded Tab-Tite universal clamping cradle. These mounting systems are made of high strength composite and powder coated marine grade aluminum and are compatible with any RAM 1" ball "B" size components. Oh and don't forget, the double ball and socket system allows for both portrait and landscape viewing! The RAM yoke clamp mount is designed with a RAM 1" diameter patented rubber "B" ball and socket system with adjustment points at the base and cradle. With a twist of the arm knob, you can move the yoke clamp mount to your optimum viewing position. The yoke mount accommodates rails from 0.625" to 1.25" in diameter. The RAM suction mount is designed with a RAM 1" diameter patented rubber "B" ball and socket system that has adjustment points at both ends of the double socket arm; this allowing for almost infinite adjustment and perfect viewing angles. 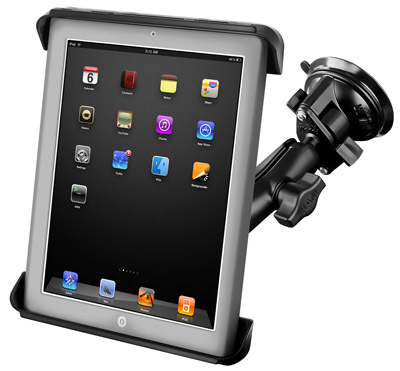 Simply attach the suction cup base to the windshield of your aircraft for an easy and safe way to view your iPad. High quality materials ensure your iPad is safe, secure, and within easy reach. RAM’s patented design also dampens shock and vibration helping to extend the life of your iPad. The RAM glare shield mount is designed with a RAM 1" diameter patented rubber "B" ball and socket system with adjustment points at the base and cradle. Simply locate the clamp on any clamping surface up to 1.12" thick and gently snug the nylon thumb screws. The double ball & socket system will provide perfect viewing angles to get the most from your iPad. The RAM glare shield clamp with double ball & socket system is far and away the most discrete and clean way to mount most any compact electronic device to the glare shield of your aircraft. The glare shield mount accommodates flat surfaces from a minimum of 4.4mm (0.17") to a maximum 28.0mm (1.12"). Review: Simple to attach and unit is flexible enough to fit most cockpits. Issue these days could be the suction which is applied to the Screen may not suit all composite windows. Fits the larger ipads very well. Review: This works great for me. A friend had warned me about not leaving it in the plane when it is parked. It can get too hot and then not provide enough suction. I am careful to take this and my Stratus down when I park. I have used this in both my Power plane and in Gliders and it has always performed top notch. Review: Arrived very fast and in perfect condition. I use this for an iPad and forefligh with a stratus 2. I had borrowed a friends to use when flying my plane from Denton TX to Oceanside CA. This holds both my iPad 2 and my iPad aide. It works with or without a case. I really like the adjustability and it holds very nicely. Very nice product. Review: Fits perfectly in my 172. Used it for the Garmin app with GDL39 for navigation and traffic. Was like having a glass cockpit right in front of me. Review: The suction cup fails after a couple of hours. Perhaps it is the contour of my Grumman Tigers windscreen. I won't trust it in smooth air much less any level of turbulence. Review: If you worried about the suction cup mount not being strong enough, don't. It is more than strong enough to hold the iPad. I am more than happy with this ram Mount. It's as tough as nails. Review: I highly recommend the Ram Yoke Mount for 10 in tablet. I use Samsung Galaxy on a Piper Cherokee. The yoke mount puts the tablet right where it is easliy seen with little obstruction of gauges. I did buy the shorter inch link arm which works better than the long arm provided in the kit. I also tried mounting under the yoke as well as on top. With the long link under works better. Cons: Second hand comment it can be overheated in the sun.